Raise your hand if you enjoy using iTunes? C’mon….somebody….anybody? Ok let’s try something else – how many of you have both an iPhone as well as Android? I knew that would be a more popular vote. 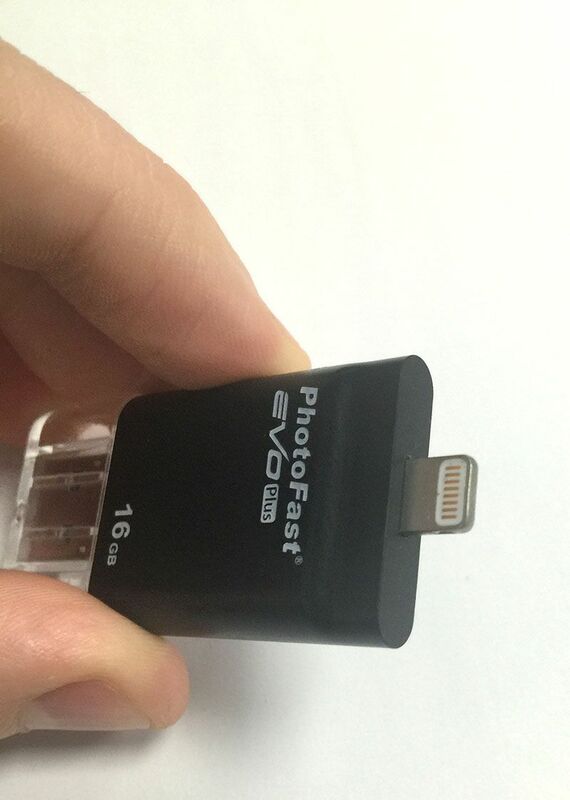 Regardless of your brand allegiance – and particularly if you dislike being bound to iTunes for simple tasks like backing up data and transferring files – the Photofast Evo Plus may be just the device for you: A USB Flash Drive (available in 16-128GB) that packs a USB3.0 connector, a Lightning connector, and – cleverly hidden within the USB plug – a slide-out USB-micro connector as well! Here at PCGamers we obviously like to keep our reviews focused on gaming-related products, but once in a while an opportunity comes along to review something a little out of the ordinary. Whilst the Photofast Evo Plus can and does relate to gaming in some ways, the majority of its usefulness is more likely to be found in organising files to and from your PC/Mac and mobile devices, whether for business or personal use. Prior to this review we had not come across Photofast, a company which according to their own PR had its earliest foundations in photographic stores such as Kodak, but saw the writing on the wall with the digital-photo age and turned to developing one of the most versatile storage mediums (and accompanying apps) that we have ever come across. Today they work in partnership with Apple as a fully MFi certified manufacturer. If you’ve seen one USB flash drive, you’ve seen them all. Or so we thought before the Evo Plus. 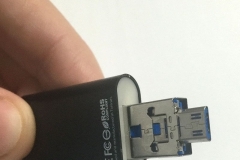 The compact, black body is available in 16, 32, 64 or 128GB capacities and features not only the requisite USB 3.0 connector like most flash drives, but closer inspection of the USB connector reveals a hidden Micro-USB connector compatible with many Android phones and tablets. Under the protective clear cap at the opposite end is a Lightning connector for iOS devices, making the Evo Plus a true multi-device tool. 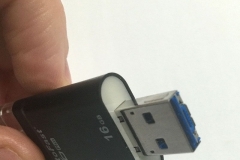 The Micro-USB connector slides out via a tiny blue tab which will require a fingernail push and can be a tad fiddly to engage, but locks into place once fully extended. Connection to a PC, Mac or Android device worked exactly as you would expect – instant detection of the device, and full access to begin transferring files to/from the Evo Plus. This function alone makes the Evo Plus a very handy tool. Connection to an iOS device also worked exactly as you would expect – needing to download an app! Installation of the “i-FlashDrive ONE” app unlocks an entire suite of tools – tools which in their own right are incredibly functional with or without the Evo Plus – but which work so much better with the external storage available for transferring and backing up. The i-FlashDrive ONE app begins with a tutorial (which unfortunately tries to run each time you start the app, forcing the user to skip it) to basically outline the features which are well laid out and fairly self-explanatory. Once into the app proper, the upper section displays storage capacities for both In-App storage and the device’s own External Storage, before making way for an array of icons which launch into various file management tools. iOS users in particular will welcome the ability to transfer files both to and from their iPhone or iPad completely free of the shackles of iTunes, without the need to jailbreak their device. It is worth mentioning that MP3s or video files which are copied onto an iOS device won’t appear alongside other files within Apple’s ‘Music’ or ‘Videos’ apps, but rather in a separate folder created by this app. It also will not allow music within the iTunes library to be copied or moved from the iOS device onto the Evo Plus external storage. However, transferring in-game images and video from your PC or Mac to your mobile device should provide no such quirks, with a smooth interface to get your fragging shared on the interwebs in just seconds. There’s a built-in media player to let you play your audio and video within the app; stream it straight from the external storage before uploading to your favourite cloud client. When using the i-FlashDrive ONE app as a file manager, simply select a file – whether stored locally, externally or in the cloud – and copy/move it to the destination of your choice. The true power of the Evo Plus and accompanying app lies in its backup and integration with popular cloud services. Backing up your contacts, calendar and camera roll is effortless. The backups can be kept on the device storage, or externally on the Evo Plus drive, and can also be set to automatically run when the device is connected. There’s also the ability to backup albums from Facebook or Flickr, as well as files stored on Dropbox and Google Drive. There’s even a built-in YouTube interface which lets you ‘cache’ videos by storing them straight onto your internal or external storage. One practical example which we tested was to browse YouTube for a video, cache that video onto local storage, then to transfer it to Dropbox for storing it in the cloud. Remember that this is all from a free app! Some of our privacy-conscious readers will revel in the combination of Evo Plus and the i-FlashDrive ONE app, with a powerful collection of features to keep your data, images, songs, videos and backups all safe and secure in a variety of ways. It offers the choice to lock individual files or folders by password protecting them. Then there’s the ability to hide those locked files or folders to keep them away from prying eyes. Not enough? How about the ability to lock access to the entire app. There’s even support for Apple’s Touch ID to avoid having to remember your password(s.) Overkill for gaming users, perhaps, but business users will find peace of mind in such advanced security features. The inclusion of a Lightning connector and MFi certification brings with it an inevitable swollen pricetag, but we were pleasantly surprised to see the Evo Plus priced at or below similar flash drives which had only USB3.0 and Lightning, but without the Micro-USB connector. The true multi-device connectivity of this device, in conjunction with the exhaustive suite of tools included free with the i-FlashDrive ONE app really do make for a reasonably priced combination – starting at under $100 for the 16GB capacity. A product such as the Evo Plus can be rather difficult to categorise. It certainly has valid uses within gaming, particularly for those who share images and videos. In day-to-day life it offers mobile users a suite of incredibly useful tools for file transfer and backup, particularly for iOS where such features are mostly locked away behind a door marked iTunes. We know of at least one user who accidentally bought a 16GB iPhone6, who basically avoids installing apps for fear of filling up his device storage; in such an instance the Evo Plus would be a savior, by expanding his storage, by creating a way to move certain files on or off his phone to create installation space, or to stream music directly from the drive.